This week Marabou is highlighting people who inspire them hoping that you’ll be inspired too! Today, Marabou is thinking about Liz Kleinrock and her thoughtful work with elementary school children addressing race, privilege, and contemporary issues including immigration and LGBTQ rights. Liz won the 2018 Teaching Tolerance Award. It’s easy to see why Liz is so inspiring. Marabou particularly likes that Liz is challenging the idea that children are too young/won’t understand/aren’t ready to have discussions around race, privilege, and inequality. If anything, children are more ready that adults. Through her Instagram account, @teachandtransform and website, Liz shares her tools and classroom work, which can be applied beyond the elementary classroom and adapted to equity and anti-bias work of all types. Below are two posts Marabou particularly likes from Liz’s Instagram. The first shows a journal prompt for her 3rd Grade class, “What would you say to grown ups who thing 3rd graders are too little to learn about things like race, enslavement, and current events?” Swipe/click through to see her students’ responses. The second is her “Lenses for Reading History.” Marabou thinks these questions should be applied when going through a museum exhibition. 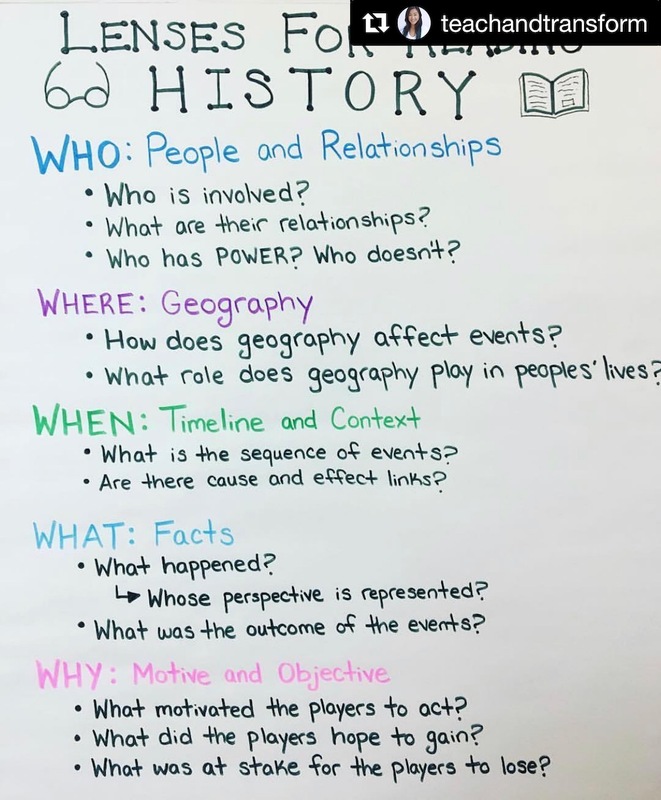 I really like the “Lenses to Carry When Reading History” anchor chart from the Teachers College Reading and Writing Project, but I felt a few components were missing when considering how to teach history with a social justice lens. I added on the “What” and “Why” categories to this chart, and I think the WHY component is particularly crucial. The motivation behind why people act in certain ways, as well as what is at stake to gain or lose is an incredibly important question to ask when studying historical events and sources.